A U.S. National Science Foundation crew has been building the 1,014-mile (1,632-kilometer) Ice Highway in Antarctica for the last three summers in the Southern Hemisphere. Photo: Bob Zook, Aspen, Colo.
ANTARCTICA - Building any highway has always been hard work that comes with huge potential to stir up steaming-hot controversy. So it's gone for the so-called Ice Highway in Antarctica. The U.S. National Science Foundation (NSF at www.nsf.gov) is building that 1,014-mile (1,632-kilometer) route on Earth's most remote and inhospitable continent. But the project isn't a traditional road. Rather, it's a cleared pathway to the South Pole designed to enhance scientific research. Unsurprisingly, building a road in Antarctica's pristine environment has raised major concerns. For example, the Antarctic and Southern Ocean Coalition (ASOC at www.asoc.org), an alliance of some 230 environmental groups in 49 countries, says that the Ice Highway "poses profound issues relating to protection of the Antarctic wilderness." 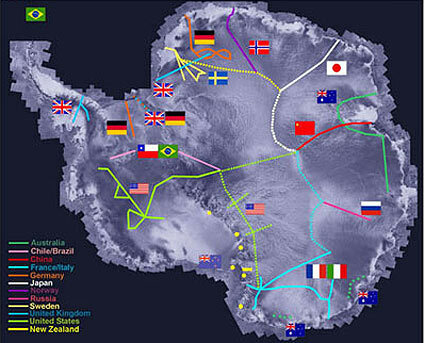 The Ice Highway (depicted in the map above by the dotted green line that moves upward from bottom and then cuts to the right) is one of a number of road projects in Antarctica. "I think it's terrible," he told the group of reporters gathered in Antarctica on Nov. 28th to mark the 25th anniversary of an Air New Zealand crash into Mount Erebus that killed 257. "I'm very strongly opposed to it,"
"It's about destroying the journey to the Pole," said the 85-year-old New Zealander, "using huge vehicles to plunge through snow and ice and crevasses to get there." A symbol of bold journeys, Hillary brings considerable weight to the Ice Highway debate. His explorations in taking on Mother Nature at her most fierce and raw are legendary. Hillary, of course, first entered history books forever on May 29th, 1953. He and unheralded Sherpa guide Tenzing Norgay that day became the first humans to reach Mount Everest's 29,035-foot (8,807-meter) peak. But Antarctic exploration is another arena in which Hillary has played a prominent (albeit less widely known) role. Knighted by Queen Elizabeth II, the man who prefers to be called "Ed" on Jan. 4th, 1959, became the first person to drive to the South Pole. It wasn't an easy commute. Working as part of New Zealand's Trans-Antarctic Expedition, Hillary drove a modified Ferguson farm tractor equipped with tracks. He began on the southern Antarctic coast, determined to reach the South Pole. Eighty-one days later, he arrived. Hillary had only 23 gallons (87 liters) of gas left. 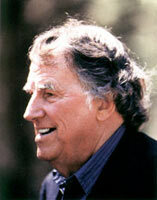 Legendary explorer Edmund Hillary (pictured) is "very strongly opposed" to the Ice Highway. "It's about destroying the journey to the Pole," says Hillary. The Ice Highway's supporters, however, are also a very formidable lot. As highways go, the project's estimated US$350-million capital investment is rather modest. But to a large cluster of the world's scientific community, the Antarctic roadway is an essential pathway leading to myriad discoveries. Sir Edmund notwithstanding, highway construction is, in fact, well underway. An NSF crew of six Americans has been quietly building the Ice Highway during the Southern Hemisphere's last three summers. Stretching from Oct. 1 to Feb. 25, the austral summer is the only Antarctic season in which construction is possible. By the time the team stopped work at the end of the second 100 days of work in late January of 2004, they'd completed 425 miles (680 kilometers) of the route. That's not nearly as far along as the NSF originally planned. The federal agency's initial time table called for completing the road next year. Now, though, NSF officials concede that it won't be finished until the polar summer of 2006. And the roadway can't be used until it passes an international environmental review. That process will likely take another year. The slow construction pace, though, isn't surprising. Part of the International Trans Antarctic Scientific Expedition (ITASE at www.ume.maine.edu/itase) formed in 1990, the Ice Highway is anything but a run-of-the-mill road project. The NSF carefully planned the route, laying out the shortest, safest and most fuel-efficient course. Even so, the Ice Highway's path is arduous. That route begins at McMurdo Station, the main U.S. Antarctic base, and then travels south, ending at another U.S. outpost, Amundsen-Scott South Pole Station. The Ice Highway's most treacherous stretch is the Shear Zone, a highly unstable four-mile (6.4-kilometer) expanse between the Ross Ice Shelf (pictured) and the McMurdo Ice Shelf. Between those two markers lies some of Earth's most foreboding terrain. The Ice Highway cuts through a frozen wilderness containing flat pack ice, as well as "snow swamps," long stretches of powdered snow often piled six feet (1.8 meters) deep. The Shear Zone, a four-mile (6.4-kilometer) expanse between the McMurdo Ice Shelf and Ross Ice Shelf, looks non-threatening. The naked eye sees only a long, flat plain thickly blanketed with snow. 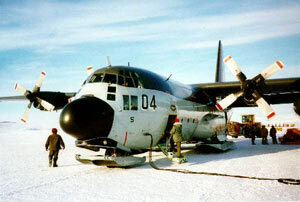 Supplies, fuel and personnel are currently flown into Amundsen-Scott Base by LC-130 cargo aircraft (one of which is pictured above). The planes make as many as 260 roundtrips a year. moving faster. That produces continual instability in the zone between the shelves. Huge cracks - invisible beneath the "snow bridges" stretching across them - are as unpredictable as they're inevitable. Those crevasses are a particular concern for the Ice Highway crew, which is using an 83,000-pound (37,350-kilogram) bulldozer to clear the path. Extreme caution in the Shear Zone is e ssential, considering what happened in 1991 to two McMurdo Station crew members. That duo inadvertently drove a D8 tractor (which also weighed 83,000 pounds) into an unseen gap just north of the Ice Highway route. Eventually, other crew members used their equipment to drag the men to safety. But they couldn't budge the tractor. Like a frozen primitive human, it still rests beneath Antarctica's surface. 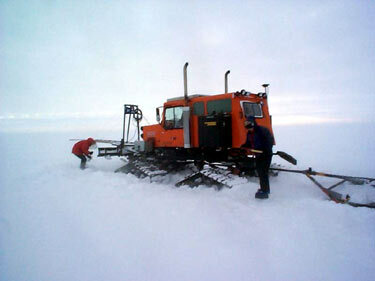 The Ice Highway crew, however, has used ground-penetrating radar. A radar sensor extends from a 20-foot (6.1-meter) boom at the front of a jeep-sized vehicle. But even with that radar, building across the Shear Zone was rough. The crew spent three months completing the Ice Highway's three-mile (4.8-kilometer) path through the area. Each time a gap was found, a crew member had to climb into the hole to judge its size. Dynamite was then lowered inside and detonated. After that, the team had to find piled snow that they could safely move to fill the remaining gap. New cracks continue to occur in the Ice Highway's Shear Zone section. Are we there yet? The Ice Highway's route begins at McMurdo Station (pictured), the main U.S. Antarctic base. stopped. Those holes were filled - a job the NSF expects to be an annual necessity. The Ice Highway's Shear Zone section is also moving. The crew returned to the area for 2003-04 construction to find a stretch about 100 feet (30 meters) longer than when they'd left. That, the NSF explained, was due to the fact that the whole zone had shifted about 330 yards (300 meters) northward. But the rest of the completed roadway remains solid and functional, according to the federal agency. Uh, are you sure we're there? 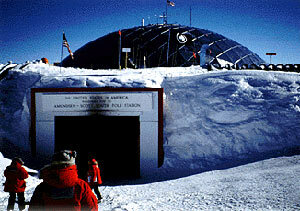 The Ice Road will end at Amundsen-Scott South Pole Station (pictured). Once it's complete, the highway will spur a broad range of scientific breakthroughs, project backers say. The ITASE expects those areas to include astronomy, atmospheric sciences, biology, earth sciences, environmental science, glaciology, geology, geophysics, marine biology and oceanography. Antarctica's remoteness makes it the ideal locale for great leaps forward in those fields, say scientists with ITASE, a coalition of 19 nations. The continent's isolation, road supporters note, makes it a particularly ripe site for weather research, providing optimal conditions for measuring climatic changes on a local-to-global scale and monitoring biogeochemical cycles. Scientists already know that turbulent currents from the Southern Ocean around Antarctica affect climates as far away as Europe and the northern Pacific Ocean. But the continent's weather hasn't been studied with the sophisticated instruments that scientists would prefer. And that's one area in which the Ice Highway could help. 1: The total number of days and nights each year (yes, that's an annual tally) that occur in Antarctic below 66.5 degrees south latitude. That obviously makes for one very long day and night. But the sunrises and sunsets in between are spectacular, taking more than a month to unfold. 5.4 million: Antarctica's total square mileage (14.04 million sq. km. ), an area that's larger than the U.S. and Mexico combined. 30: The average number of feet (16 meters) a year that the ice sheet shifts atop the South Pole's official marking. That movement necessitates the annual remarking of the pole's precise position. 98+: Percentage of Antarctica's land mass that's permanently covered by ice that's built up over millions of years. The average thickness of that ice sheet is more than 7,000 feet (2,123 meters) - more than a mile and a third (2.1 kilometers). Parts of Antarctica's ice covering, however, are twice that thick. 90: The percentage of Earth's total ice that's in Antarctica. That, in turn, represents about 70 percent of the world's fresh water. 200: Feet (61 meters) that scientists' estimate that worldwide sea levels would rise in the highly improbable event that the entirety of Antarctica simply melted all at once. 180: Speed in miles per hour (288 kilometers per hour) of Antarctica's peak wind gusts. LC-130 cargo aircraft now fly in team members, fuel and supplies to Amundsen-Scott Base, making as many as 260 flights during Antarctica's four-month summer season. (The planes also carry waste back on return trips.) But some scientific instruments simply won't fit through the planes' 10-foot-by-10-foot (2.7-meter-by-2.7-meter) doorways. They will fit, though, aboard the Ice Highway's planned vehicles. The ITASE envisions that each journey will involve six tractors, and 21 sleds and tracked trailers, with as many as six roundtrips each year. Some plane jaunts will still be necessary if speed is essential. One-way flights take six hours, while one-way Ice Highway trips will take 30 days. But those longer trips would get more sophisticated equipment to Amundsen-Scott Base. Road trips will also be far more economical, according to analysts with the U.S. Cold Regions Research and Engineering Laboratory (CRREL at www.crrel.usace.army.mi). Six yearly Ice Highway trips could carry 243,500 gallons (925,300 liters) of fuel from McMurdo to Amundsen-Scott for between $0.63 and $0.84 a pound, the CRREL asserts. By comparison, plane transport costs $13 per pound. None of those analyses, though, have assuaged environmental groups' concerns about the Ice Highway. The ASOC, for example, earlier this year criticized the NSF's environmental evaluation. The U.S. agency's report on the road's "direct impacts . . . tends to be more [about] the impacts upon science and operations than upon the environment and . . . to include reference to mitigating factors," the environmental group charged in its position paper. The ASOC also took the NSF to task for only devoting three paragraphs of its 142-page report to the highway's "indirect/second-order and cumulative impacts." One of those impacts will come from the NSF's increase in Antarctic travel. The Ice Highway will mean fewer plane trips to the South Pole. But the federal agency plans to use freed-up LC-130s for more "deep field research." "It would seem that what might be proposed," the ASOC concludes, "is merely a switching of routes, not a fundamental reduction in aircraft use. If that is the case, then it should not be suggested that there are fuel (and therefore environmental) savings. It might be a zero-sum-game." But the NSF asserts that the entire project meets the rigorous environmental protocols set out in the Antarctic Treaty (www.scar.org/treaty/at_text.html), which governs the continent. The road's impact on tourism is another major concern. Antarctic tourism is a major growth industry. While less than 5,000 visitors came to the continent in 1990, by 2003 that number had risen to 15,000. A South Pole gift shop has even opened. Environmentalists want a hard, legally binding cap on Antarctic tourism. Without that, they say the continent will be flooded by an unchecked influx of additional visitors, as tour operators piggyback on the Ice Highway. "The purpose of regulating tourism in Antarctica is not regulation for regulation's sake," the ASOC asserts. "It is about protecting Antarctica - a global wilderness, global commons and global heritage - against the actual or potential negative effects of . . . the largest and fastest-growing global industry." The Sierra Club (www.sierraclub.org) echoes that worry, saying that "the growing tourism market . . . threatens species and the wilderness character of the region." But resolving such issues could be a bit like building the Ice Highway. It won't be simple, since no single nation controls Antarctica. The continent is regulated by the Antarctic Treaty's 45 national signatories. Created in 1959, that international pact reserves all of the continent below 60 degrees south latitude for peaceful research. "It is in the interest of all mankind," the treaty said, "that Antarctica shall continue forever to be used exclusively for peaceful purposes and shall not become the scene or object of international discord." Ultimately, affirmation of harmony could face a major test in the Ice Highway's aftermath.